On the heels of a stunning new revelation that another FBI informant had tried to infiltrate the Trump campaign during the 2016 U.S. presidential election, House Intelligence Committee Chairman Devin Nunez has made a formal demand to the Justice Department to disclose how many FBI informants, or spies, were used to set-up or track the Trump campaign team, and associates. Congressman Nunez has given the Justice Department a Monday deadline to produce documents and provide information on the FBI’s use of "informants against members or associates of the Trump campaign, and how many informants were used and how much money was spent on their activities." He is specifically asking for more information about "any contacts" and any “efforts to engage” between FBI intelligence sources and a dozen Trump campaign associates, including Donald Trump Jr., Michael Cohen, Michael Flynn, Stephen Miller, Peter Navarro, Corey Lewandowski, Michael Caputo, Sam Clovis, Sam Nunberg, George Papadopoulos, Carter Page, Walid Phares, Joseph Schmitz, and Roger Stone. Question from Gaetz - Are you aware, as you sit here today, of any payments that were made to any person to collect any intelligence on the Trump campaign prior to July 31, 2016? Answer from Rosenstein - Nope. But keep in mind I wasn’t there. I only know what information that we have obtained from the FBI records. Question from Gaetz - Are you, as you sit here today, aware of any efforts to contact Roger Stone that occurred prior to July 31, 2016? Answer from Rosenstein - I don’t have any personal knowledge Congressman but I know that we are seeking to respond to Chairman Nunez’s request. Question from Gaetz - How about the same question as it relates to Michael Caputo? Answer from Rosenstein - I was’t there, and so I can only answer questions that we direct to the FBI. Also on Thursday, June 28th, the United States House of Representatives passed a measure demanding that the Department of Justice turn over all documents by July 7th related to any information about informants used to spy on Trump associates during the 2016 presidential election, and a plethora of other documents the DOJ has resisted turing over to the House Intelligence Committee. Deputy Attorney General Rod Rosenstein could be held in contempt of Congress, or he could be impeached if he continues to withhold the information that Congress is demanding. So far, we know of at least two FBI informants who approached Trump campaign associates in an elaborate scheme to entrap them into treason or a perjury trap by offering the targets “dirt” on Hillary Clinton and by introducing some of them to a few Russians that the Trump associates were later accused of meeting - which was used as a pretext to initiate and validate the Trump investigation. Stefan Halper, a confirmed career-long CIA and FBI asset lured Cater Page and George Papadopoulos into perjury traps for misremembering or misrepresenting meetings they had with Halper, or with people Halper had introduced to them. And it was just revealed that a 17 year-long FBI informant, operating under the alias of Henry Greenberg tried to sell negative information on Hillary Clinton to Roger Stone and Michael Caputo - an offer that was immediately rebuffed by both men, but yet another example of government intelligence agencies run amok. Stefan Halper, the FBI informant who was paid to set-up or spy on Trump campaign associates George Papadopoulos, Cater Page and Sam Clovis is a career spook who was once married to the daughter of retired CIA Deputy Director Ray S. Cline. Cline was a good friend of former president George H.W. Bush, who he had befriended during their work together at the CIA. The Hapler/Cline family has close ties to the Bush clan. Stefan Halper even worked on the 1980 Bush presidential campaign as National Director for Policy Development, and donated $85,000 to the effort. Surprisingly, Halper was also a classmate and friend of Bill Clinton when they attended Oxford together. Halper professes to be a professor at Cambridge University, but his reported income suggests that his real job is in espionage. 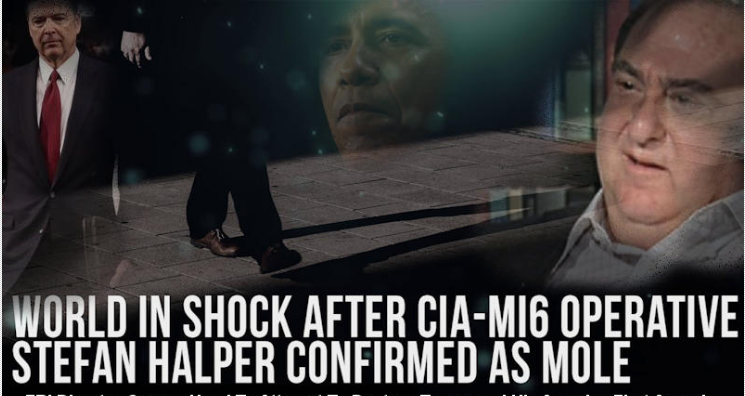 Halper was recently paid at least $411,000 and reportedly up to $1 million through the Office of Net Assessment, a U.S. intelligence service within the Department of Defense. Beginning In March, 2016, over 4 months prior to the July 31, 2016 date when the FBI claims to be the beginning of the Trump Russian collusion investigation, FBI informant Stefan Halper was sent to set-up George Papadopoulos. Halper met Papadopoulos, according to statments made by the government “by chance” while traveling in Italy on March 14th, 2016, but we now know that to be untrue because Halper was sent there at the behest of the FBI. The meeting was not a random coincidence. The men supposedly struck up a conversation about Russia and decided to meet again on March 24th, in London, where FBI informant Halper, introduced Papadopoulos to a female foreign national from Russia who was used as part of the plot to impicate him. Halper then paid Papadopoulos $3,000 to give a speech in London on April 26th, 2016, and revealed to him at that time that Russia had dirt on Hillary Clinton in the form of thousands of damaging emails. Papadopoulos did not disclose all of these details to the FBI when questioned about it and misremembered a few dates about his encounters with the FBI informant Stefan Halper and the female Russian national that Halper introduced him to, so based on those errors in his timeline he was arrested for perjury and then pressured to reach a plea deal with the same FBI that had paid an informant to frame him. Papadopoulos pleaded guilty to lying to the FBI to avoid 5 years in federal prison because he told them that he met Halper and the female foreign national from Russia before he was on the Trump foreign policy team, but based on FBI documentation it appears that Papadopoulos met the woman a few days after he was appointed to the foreign policy team. He was originally approached by FBI informant Halper on March 14, 2016 right between the time that he learned he was going to be on the foreign policy team, but not yet officially on the team (March 6th) and March 21, the date in which Trump announced Papadopoulos was joining the newly forming team of foreign affairs advisors. One could argue, and Papadopoulos has, that he was not even an official member of the foreign policy team until Trump announced it - which was a week after FBI informant Stefan Halper approached him in Italy. Papadopoulos did nothing illegal or improper by conversing with foreign nationals, except to misremember the date he met them. As a foreign policy advisor - it was his responsibility to discuss world affairs with foreign dignitaries. Based on email evidence and sworn testimony it appears that Papadopoulos was much more interested in reporting to campaign staff about his belief that the Russians wanted better relations with the Americans going forward rather than anything related to the Clinton emails that FBI informant Stefan Halper told Papadopoulos about in an effort to set him up. Since Papadopoulos had no interest in the emails, the feds manufactured a perjury trap. Read the Papadopoulos plea deal here. In the summer of 2016, in the run-up to the November presidential election, and around the same time that FBI informant Stefan Halper offered Carter Page and George Papadopoulos “dirt” on Hillary Clinton, Roger Stone and Michacl Caputo were approached by long-time FBI informant “Henry Greenberg’, who was also offering information of great value to the Trump campaign. The connection between Halper and the FBI has already been established but the ongoing investigation into Greenberg has only just begun. During Caputo’s meeting with Special Counsel investigators he recalled a phone call he received back in 2016 from a man who identified himself as Hank Greenberg who said he had dirt on Hillary Clinton. Caputo referred him to Roger Stone, to vet. Stone had a brief meeting with Greenberg at a restaurant in Miami where Greenberg offered to deliver "negative information on Hillary" for $2 million. Stone scoffed at the suggestion that he or Trump would pay for opposition research and concluded the meeting with a text back to Caputo telling him that it was a waste of time, and suggested that Greenberg was crazy. Caputo was stunned to learn that the feds knew more about “Greenberg” than he did. He became suspicious and then determined to find out who was Henry Greenberg. Using the resources of the Caputo Defense Fund, Michael Caputo hired a private investigator in America and also in Russia to find out more about Henry Greenberg. The answer to that question was compiled into a 140 page dossier on the background of Mr. Greenberg, his ties to organized crime and the work he has done for the FBI. 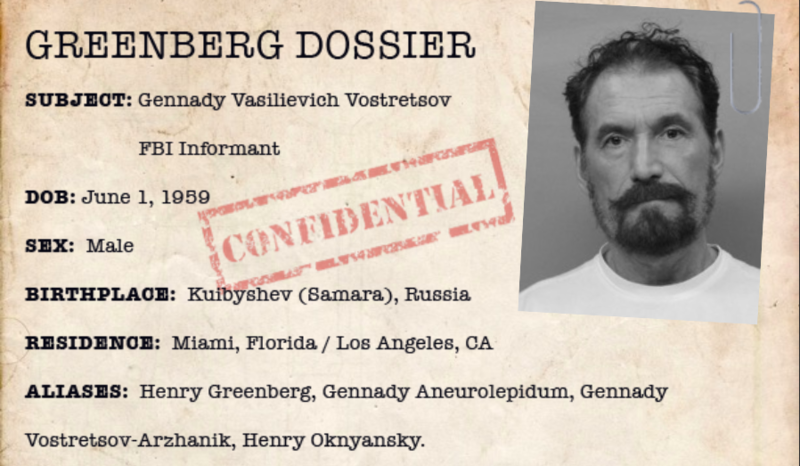 Henry Greenberg’s true identity is Gennadiy Vasilievich Vostretsov. He has used at least four different aliases in the past, including Gennady Aneurolepidum, Gennady Vostretsov-Arzhanik, Henry Oknyansky and Henry Greenberg. Under his different identities, he has spent at least 10 years in Russian prisons and two years in U.S.federal detention for fraud, theft, child support, assault with a deadly weapon and multiple occasions of driving under the influence. He is a convicted violent felon, from Russia, who would not have been admitted into the United States if it were not for the 14 separate visa waivers he received from the FBI. In a 2015 court filing Greenberg admitted that he has been an FBI informant for the past 17 years and has risked his life in Iran, North Korea and in the United States while working undercover for the FBI. With a criminal record "Greenberg" could not be in the United States in 2016 on any other type of VISA. Hopefully, the House Intelligence Committee will be able to learn exactly how the FBI Informant was in the USA that year. This new revelation offers additional proof that the Trump presidential campaign team and associates were spied on and set-up to be entrapped by factions of the U.S intelligence agencies and leaders of the Justice Department who were politically motivated to prevent Trump from becoming, or remaining, president of the United States.